EDGEN is a "kinematics spreadsheet" developed by EDC. EDGEN uses positions and velocities supplied at up to eight user-specified locations (e.g. Initial, Pre-braking, Impact, etc) to determine the time required to travel between each location. Using this time, EDGEN calculates the average linear accelerations between each location, and then calculates the current velocity and position at each timestep between the user-entered positions. 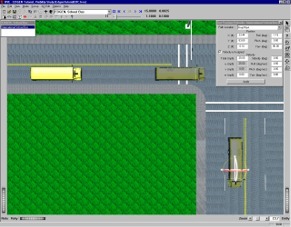 When used for a vehicle, EDGEN calculates the motion of the sprung mass. Three degrees of freedom (X,Y linear motion, and yaw angular motion) are calculated. Suspension deflection and tire spin degrees of freedom are not included. Linear Interpolation - EDGEN uses linear interpolation between user-entered path nodes to define the path position and orientation. This can result in discontinuities at the nodes, however, the result is somewhat more predictable. Spline Interpolation - EDGEN uses spline interpolation between the path nodes to define path position and orientation. The result is a smooth, continuous path that is guaranteed to be tangent at each node. EDGEN inputs include one vehicle, and an optional environment. Event set-up parameters include at least two and up to eight positions and velocities for the vehicle. EDGEN output reports include the Accident History, Variable Output and Trajectory Simulation.